Helping those in the general population join the workforce. Preferred Employment Services currently works with the Missouri Department of Economic Development and local Workforce boards to provide employment services in conjunction with local Job Centers in four regions of Missouri. Presently, we work with the adult population in three regions: Central, Southwest and West Central. These regions cover numerous counties, but we provide a physical presence at Job Centers in Columbia, Jefferson City, Lebanon, Linn Creek, Fulton, Mexico, St Robert, Joplin, Neosho, Monett, Clinton, Nevada, and Sedalia. 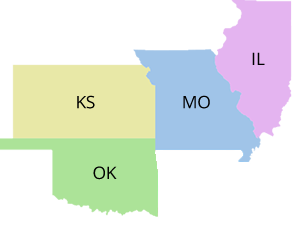 Our services to youth can be found in three regions covering multiple counties in Missouri: Ozark (Branson and Springfield), Southwest (Joplin, Monett, and Neosho), and West Central (Clinton, Nevada, Sedalia, and Warrensburg). Preferred Family Healthcare is an equal opportunity employer/program. Auxiliary aids and services are available upon request to individuals with disabilities. Missouri Relay Services at 711.